‘By the quiet of the lake he whispered goodbye, snowflakes kisses melting into his tracks as he slipped away behind white dusty lines.' Laura works in narrative, carefully crafting together photography and poetry, breathing life into the written form; transporting her subjects to a spellbinding world based on their own reality and personal experiences. Laura’s poems and imagery are layered in meaning and symbolism, captivating the attention of the audience: 'Summer creeped in gracefully over the garden gate, perfumed in floral scented notes, unveiling a layer of mist over his gaze'. 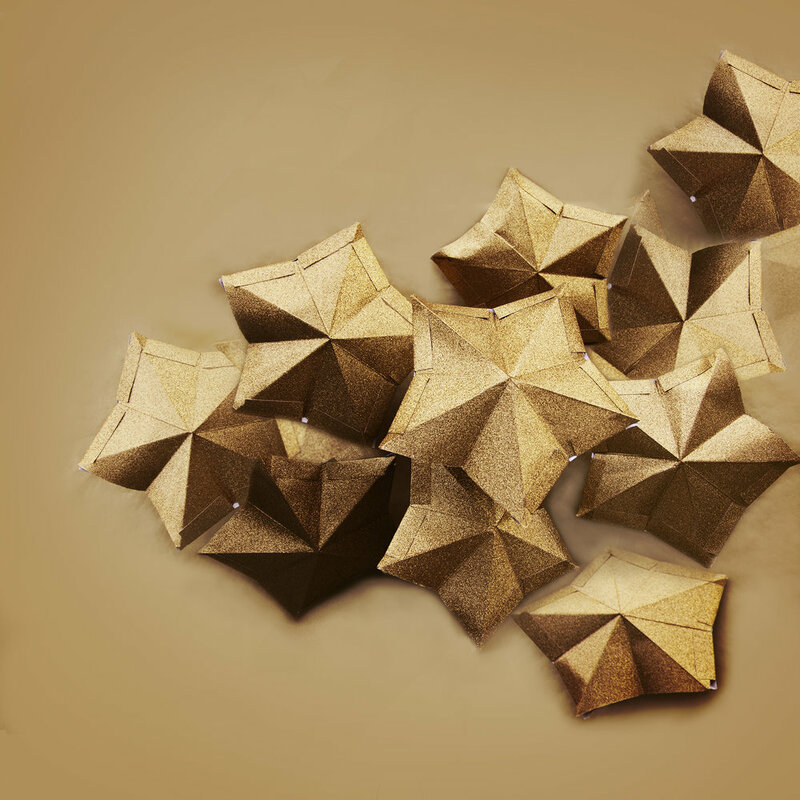 All props are delicately designed by Laura, hand made or selectively sourced for each individual photographic art piece. The set is then incorporated into the location creating a magical realist world for her subjects to dwell, opening the path for her viewers to wander. Delve into the following three highlighted features from the site from commissioned to personal projects and explore these unique and captivating stories. The Painted tale is taken from a personal series entitled 'Chasing butterflies'. Here Laura explores the complexity of Love; its ever- changing faces and the fragility of her characters caught up in the intricacy of this subject, "Sweet peas, iris leaves and common weeds. Forget-me-not. he loves me, he loves me not.' Click the image above, adjacent or scroll down to explore the painted tale. Handmade 3D butterflies. Crafted from card and layered together. Feature 3 - Red origami crane used in Akai tsuru chan. 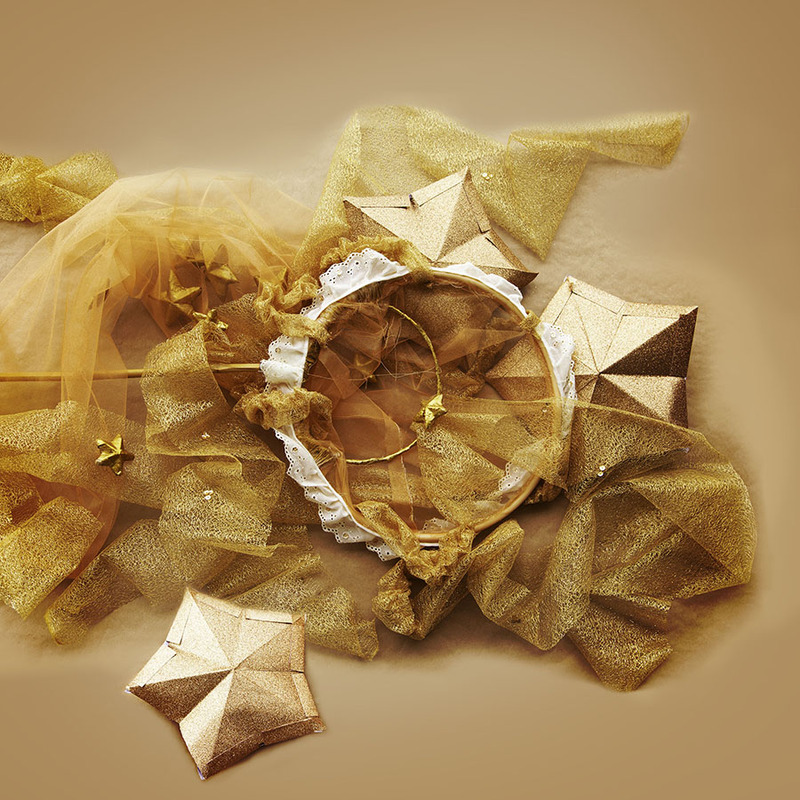 Feature 2 - Golden glittered 3d stars and handmade dreamcatcher net with gold lacquered paper maché stars. Akai Tsuru Chan translated from the japanese to english means ‘little red bird’. One woman’s story of Miscarriage, of loss, depression and finding hope through the dark clouds around her. Raising awareness for others who have struggled in silence. Lady of the starlit sky is a piece layered in many meaning and personal details for the beautiful Maya. Time is effortlessly paused in this moment, capturing Maya in all her beauty on the cusp of making her mark on the map of life. when morning comes he is gone and all is lost. settling for a moment, only to leave its mark. bringing silence to all in sight. vanishing beneath the fading light. When morning comes he is gone and all is lost. As a child I remember those long summer days at Granny’s, running through the long grass and fields of Northiam, chasing butterflies. We would catch them in the palm of our hands for a moment, before letting go. The tiny traces of powdery residue from their wings remained on our fingertips, lingering till we wiped our hands dry on our shorts. As an adult those butterflies returned but as a metaphor, fluttering in the pit of my stomach, the churning of anxiety, the pounding anticipation and that first love. Painted into the palm of ones soul. Still, I lay in waning light. a flame, once burned. Whole and bright. flickered with the closing gate. gathering round my swollen throne. No requiem for our stolen star, bursting into endless night. in soft silver whispers of a thousand silent words. wrapping warm red wings around my empty sides. released into the faded night. washing dry the tears of yesteryears. A personalised portrait capturing a difficult time In Nicole’s life with a positive message and a way of healing. It is a story about miscarriage, loss, depression and finding hope through sadness, coming out the other side. Styling behind the image lies in a collision of cultures and customs. Nicole is half Japanese and Swedish, having recently married it seemed appropriate to be photographed in her wedding garment on a beach replicating her wedding day. The crown is inspired from Swedish old traditions of wearing a crown or wreath upon the bride’s head. The title ‘Akai tsuru chan’ translates literally from Japanese to english as ‘Little red crane’. The cranes have been chosen for a number of reasons given their symbolic nature of healing and providing hope during challenging times. It is believed that if you make a thousand paper cranes a desired wish will come true hence the ‘thousand silver and white cranes’ captured in flight. The red crane in her palm serves as a memory and symbol of her loss. watching as the great stars align. which looms above the passage of time. breaking boundaries and healing pain. finding strength on the pitch where I play. Fighting, for my part on this stage called life. The magic of Maya’s constellation fills the dusky night sky. Twinkling stars configured in clusters of twos and threes significant of her auspicious arrival into the world, her date of birth and weight all of which repeat the same recurring pattern of numbers: born at 2.23am, weighing 3.23kg. A grand total of 23 stars can be counted in the piece, a symbol of the 23 strokes in her Chinese name and her lucky number. Through the midnight blue celestial sphere a hidden fish outline can be traced with a finger. A silent nod to her astrological water sign, Pisces. Against the darkness Maya stands affirmative and illuminated, an intrepid explorer on the cusp of her universe. A golden rope falls from her dreamcatcher, loosely wrapping around her ankle, anchoring her to the core but not holding her back. (The rope acts as the unbiblical cord to her universe and a symbol for her rock climbing passion.) Behind, dark brown rocks rise, strong in nature and bold against the ocean. A reflection of Maya’s personality which I feel is one of independence, strength, courage and determination denoted by the sports she plays; Muay Thai, boxing, touch rugby and rock climbing. Either side of her waterfalls cascade down lower rocks, mirroring the Taoist philosophy of Wu Wei, “flow with the water and the water will flow with you” and her love for waterfalls. In her hand she firmly grips a hand made golden dreamcatcher which shines brilliantly; semi filled with small paper maché stars and interwoven with bronzed sequins in the same recurring numerical pattern. A tiny emblem of goals already achieved. Scattered around her glinting in the soft light, a further collection of three large stars, close by but not quite within grasp, illustrating the possibility of hurdles to conquer. Finally, looming above her a solo shooting star inflames the horizon leaving a limitless path of wishes, dreams, aspirations for the future and journey ahead. What is in a name and can it influence us on our road in life? Maya was named after one of the great influential and cultural pioneering women of our time, Maya Angelou. Her middle name Tao was chosen thanks to the ‘Tao of Pooh’ a wonderful discovery which in my research to this portrait I read, having previously very little knowledge on the subject of Taoism, subsequently I stumbled across Wang Wei, the great Chinese landscape painter and poet whose work was strongly influenced by Taoism. I found this alluring given Maya’s middle name ‘Tao’ as well as her (heritage), passion for rock climbing and love of waterfalls.